These two letters are both to Sarah Benson, the first is from her husband, the second is from her father in law. Father on Friday and came back yesterday. He is well and doing well they are all geting a long finley there is nothing here new nor strange down there they are campt at a very nice place now it looks righ funny to sea all them old men in camps, Sis I think I will run a way and go to the Regt if they don�t come back in a few days for I am tired of staying hear Joseph Bates is well I have nothing more that would interest you at this time you must wright soon Direct your letters to Adams run as usual remember your friend until death Lieut R.T. Benson, I want to sea you badly give my love to all enquiring friends and actsept my very best love and respects yourself most respectfully yours R.T. Benson to Mrs Sarah A. Benson good night my dear daring gal. The following letter is from Lt. R.T. Benson's father who is also on active duty at this time. (Written around the letter is this) Turn this round and round and do what you can with it. instructions what to do. We have had some very cold weather here the ice lay here in the shade for two days that was thrown out of a pan we had a steady wind two days and nights from the south west and then it got in the north and it commenced raining last night, a fine light rain all nigh this morning it rained in earnest all the morning with an east wind. You must have had a fine time with your company I wish I had been there two, I do not want any watch now. It is thought that Wm. Powell cannot live. Captain Goodlett saw him today he is the only one in our camp that is dangerous I am thankful for the compliments sent me return the same to them. Thanks to Randy Hawkins for copies of the Benson letters. The Sixteenth is in Wilmington, N.C. concerned with the advance of Union forces in that area. Lt. Benson returns to a nearly empty camp. As more and more forces are drained to other theatres of action the old and the young are called up to defend against the invader. P.B. Benson, the father of our Lt. Benson, is no exception. He finds himself near Pocotaligo in camp with men his age. The sight of these old men ready to fight seems amusing to Lt. Benson, yet many have already proven themselves in far-flung and now forgotten places like Mexico and against the native tribes in Florida. Doubtless there is a graying, baldheaded face or two that marched with Andy Jackson down the Mississippi, in a war that was about pressing men. This issue of pressing or kidnapping by armies and navies still remains fresh to Lt. Benson. He seems none to happy about being pressed into service in the absence of his unit. Shortly, the Sixteenth will be back and grandfather will find his way back to the mountains he loves, only to enlist again. That not withstanding, grandfather's heart has found him out, and as long as he draws breath, he will be willing to fight and die for liberty. It burns bright in all of them; they are on fire for the protection of their right to govern themselves. Let us hope the men and women of South Carolina will forever so burn. Perhaps the most interesting thing about these two letters is the comparison between the letters and how this relates to the two ages of men. Lt. Benson is a young man with a young man's concerns. Corporal, later Sergeant, Benson is an old man, who knows tenderness and love of family and children; he is also given a good bit of insight into the hearts of those that he loves. I should have liked to have known both of these men, as they were... but today, on this day, it is given to only one to be Grandpa... and his is the tender hand. Like Boss in Faulkner's The Reivers, he has grown older and wise enough to know the value of a gentle hand and a loving heart. P.B. Benson served as a Corporal in Company F of Elford's Third State Troops from June of 1862 until January of 1863. Benson also served as a Sergeant in Company H of the First State Troops from August of 1863 to February of 1864. Willam Powell is a Private in the same unit. He is not listed as having died in Broken Fortunes, but I am not sure if it was possible for that work to include the men in State Service. Enlistments and records on those units are probably limited. There appears to be only one Captain Goodlett in Confederate Service, he is Captain B.A. Goodlett of Company K of the 16th, he would be known to both Lt. Benson and his father, it is my belief that he is the Captain Goodlett in question. 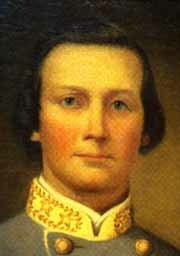 R.T. Benson was a Lieutenant in Company G of the Sixteenth South Carolina.